Flow of the Fedchenko from Vince Shuley on Vimeo. and Vince Shuley) at 5,000 meters on the Fedchenko Glacier. I sat leaning on the outside wall of the Gorbunov Meteorology Station sipping on a splash of génépi, celebrating with the team our coming arrival onto the Fedchenko Glacier, which now lay just 300 metres away. The warm sun beat on my face and I wiggled my toes on the dry rocks in front of me. Taking another sip of génépi - one of our two bottles of booze we had carried up here - I questioned the bottle's weight. At that point I also questioned how we had even gotten here. It had taken two years of planning, three days of flights to Dushanbe, five days of in-country preparation with three days of ground transportation in an overloaded Nissan Patrol and a GAZ-66 Russian military truck in the Gorno-Badakhshan Autonomous Province (GBAP). This was followed by the eight days of slogging up and down, up and down the talus-covered Russian Geographical Society (RGS) glacier with almost two-hundred pounds of gear each. We were now at the access point onto the Fedchenko Glacier having traveled up the crevasse-ridden RGS Headwall three times. 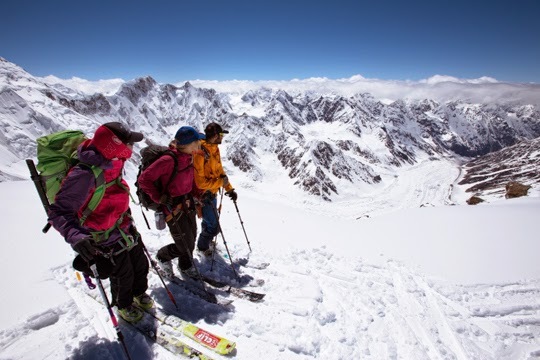 'Team Flow' was deep into the Pamir Mountains, the so-called 'Roof of the World.' The surrounding peaks were massive, some rising above 6,000 metres, and the 77-km Fedchenko Glacier was vast… I felt so little. Team Flow finally hauling sleds on to the Fedchenko Glacier. I was trail running in Garibaldi Provincial Park with Naomi Dunaway. She asked what mountain I was going to try and climb next and I told her I had no idea. I had just returned from an expedition in Denali National Park and she assumed I would be into more high-altitude suffering. She said that I needed to meet Emelie Stenberg, an ACMG Ski Guide, who had ideas of crazy zones to ski in Central Asia. A few months later photojournalist Vince Shuley and I met Emelie for dinner in North Vancouver. She pulled out a map of the Pamirs and walked us through her plan to traverse the Fedchenko Glacier. During her research she had also found an old Alpine Journal article about a Russian ski expedition that traversed the Pamirs in 1995. 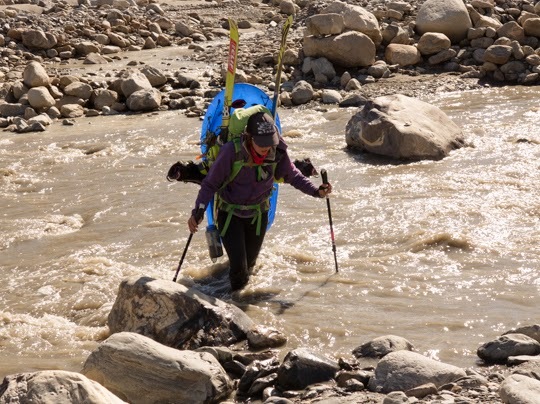 Ours was the first unsupported expedition to cross the Pamirs from the SE to the NW - a distance of 480km. If you try to imagine spending 30 days as one of a small four-member group, at altitudes up to 6000m and temperatures sometimes down to -34°C, with only 550 grams of dry food per person per day, you will have some idea of the challenge we faced. - from the Transpamirs Ski Expedition, The Alpine Journal, 1995. Emelie's idea sounded horrible. Vince and I were both hooked and began the planning process. I knew nothing of the former Soviet Union 'Stans' nor the Pamirs. Tajikistan is west of China, north of Afghanistan, east of Uzbekistan and south of Kyrgystan. 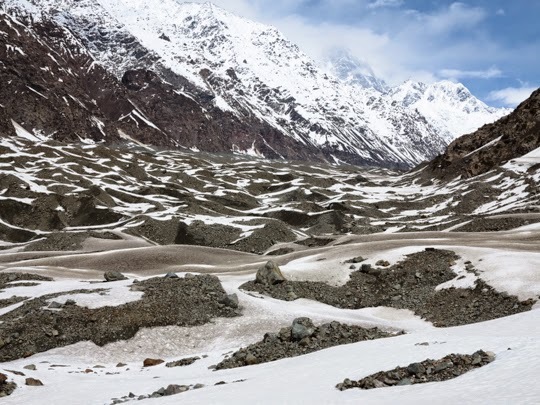 The Pamirs take up about eighty percent of the country and mainly lie in the GBAP, few stories of its 6,000 metres-plus peaks have been recorded. Yesterday Team Flow had passed all the necessary military check points and we were only three kilometres away from Poi Mazar when our overloaded SUV burst a tire trying to cross the river. Saidali, our local fixer from Pamir Guides made a call on his cell phone to Jafar, our host in Poi Mazar. We frantically organized our gear for the 30-day expedition in the dark, leaving any unnecessary equipment and food in the SUV. 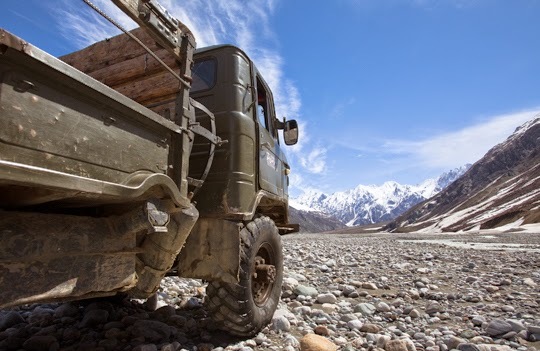 Jafar and his GAZ-66 truck arrived and we loaded it up as I negotiated the rate of passage – what later seemed like a pointless task when our other choice was to sit in the dark on a riverbank full of boulders for the night. Our driver bade us farewell and left us with a warning, "Be careful, you will get so high that Sputnik will hit you." Upon arrival to Jafar's home, he fed us our final home-cooked meal for the next month and registered our team's entrance into the Tajik National Park. We wrote out our team's intention of crossing the RGS glacier, traversing the Fedchenko and exiting out towards the Bartang Valley. Jafar gestured avalanches with his hands and shook his head. He then flipped through his Tajik-English dictionary and stopped. He pointed at one word: “impossible”. 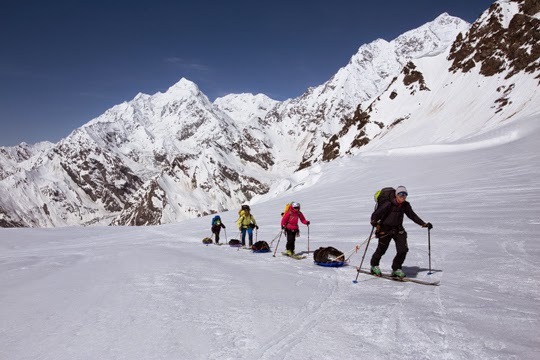 Today we again loaded into the back of the military truck and continued the bumpy ride to the foot of the RGS glacier and began ski touring with our packed sleds. After 400 metres we hit the River Abdulkhahor. As I sat with my gut rotting from recently ingested water and/or food, Selena entered the river to gauge the deepness. Zebulon shimmed across a destroyed bridge line to the other side of the river to create a Tyrolean traverse. We shuttled our 200 lbs duffles and backpacks across before crossing the river on foot and soaking ourselves. 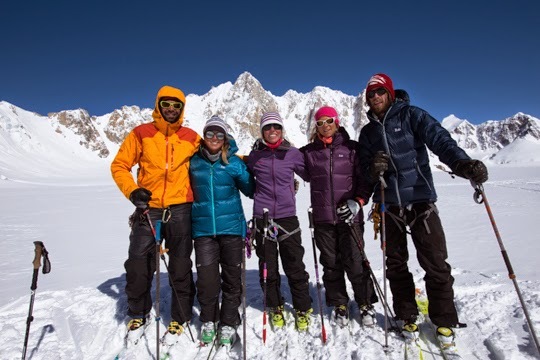 Two months before our departure, Emilie, Vince and I had decided in that our team would need at least one or two more members in case one of us got hurt and the other two couldn't begin the traverse. We had recruited Zebulon Blais, a guide on Mount Rainier with numerous Denali expeditions under his belt and Selena Cordeau, a glaciologist and expedition cook who had completed several sizeable ski traverses. Their experience was obvious and we were happy to have them on board, despite only having traveled less than a kilometre on our first day. infrastructures and drops them off for the 29 day human-powered expedition. Whumpf… "Avalanche! Avalanche!" yelled Zeb. I watched his yellow jacket sliding down about 10-12 metres to the left of me. The slab continued to propagate hitting Vince. Emelie had stood next to me on the track digging a hasty pit, now she had already begun traversing away quickly from the slide path. I took my eyes off of Zeb's yellow jacket, flipped 180 degrees and began descending in touring mode with my ski crampons. As I stopped, Emelie was already racing back towards the slide path and yelling for everyone to switch their transceivers to search mode. Selena, the most downhill of the group was racing up towards Vince, who screamed he was fine and to find Zeb. A hand was spotted wiggling its fingers in the debris. Zeb had raised his arm in a desperate effort to fight the snow as it slowed and solidified around him. Emelie and Selena began digging his face free with their bare hands. Selena and I dropped down to the side of his body and began to dig quickly in a conveyor belt fashion. Vince was buried up to his waist but managed to dig himself free. As Emelie protected Zeb's face, he gasped for air. Selena and I cleared his body and I removed his backpack and checked him for injuries, head to toe. Zeb was unharmed but cold and shaken. 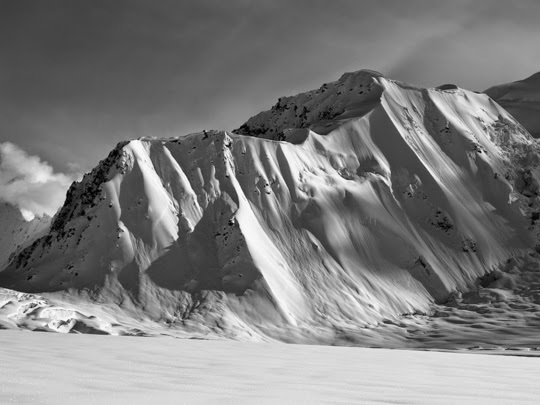 We found his skis and poles a metre deep in the debris and we quickly gathered our gear and returned to Camp 7. Having left camp at 5:00 a.m. -25 degrees Celsius with no formal breakfast, we returned to the kitchen tent to eat, evaluate the avalanche and examine the human factors that lead to this incident. 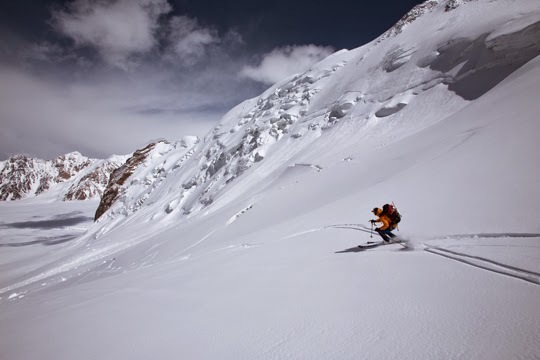 We had already skied two days of 20 degree slopes and decided that risking our group on any steeper terrain this deep in the Pamirs would be frivolous… our dreams of first descents were beaten. Zebulon Blais skiing low angle pow from a 5,000 metre col on Day 14. After four days of bad weather, being tent bound reading our books backwards, we awoke at 6:30 a.m. to the sun shining on our tents. It was our window, our “go time.” We rallied a quick breakfast, put our skins on, grabbed our day kits and began skinning fast due to the frigid temperature. Again, I felt so little… As we reached the fork at the end of the Fedchenko Glacier, Independence Peak (formerly Peak Revolution) at 6,940 metres towered above us. Team Flow smiled and took a group picture before Selena retreated back to Camp 8. Symptoms of Acute Mountain Sickness (AMS) had plagued her for almost ten days with our altitude above 4,000 metres and Diamox offered her little help. The other four of us continued on to ascend a col to the West. Reaching our high point of 5,500 metres we looked down the Yazgulom Valley to another vast glacier and endless high peaks of the Pamir Range. of 5,500 metres on a col to the West of the Fedchenko Glacier. We awoke at 5:00 a.m. and after a quick breakfast we set off back up the Tanimas Valley. Our backpacks were empty and we had one final load to retrieve before settling back into Kok Jar Pass for the night and awaiting our pick-up from Pamir Guides the next morning. My biggest challenge of the expedition was at the beginning and the end, where we were forced to carry the heavy weight all on our backs. Until we had reached the intersection of the RGS and Fedchenko glaciers, we could not use our sleds due to talus, scree and crevasses. On Day 6, I remembered breaking-down and sobbing my first tears to Vince as he gave me a reassuring hug. I had not expected to walk in running shoes for days over scree and carrying all my load. I told him my body ached and that I wanted to go home. Vince and I had made a pact to arrive to retrieve our final load by 11:00 a.m. I arrived at 10:55 a.m., loaded my backpack for the last time, negotiated a trade of my last salami with Emelie in exchange for some Clif Shots Bloks and began to shuffle over rocks and plunging through river crossing with my final 60 pounds of gear. I was amazed to see goshawks flying in the air, ibex scaling the sides of mountains and rusted tin cans in the dirt, all signs that we were no longer so distant from civilization. Shortly after beginning our final leg of the journey, Vince twisted his ankle, which allowed me walk at a slower pace. We were both reaching exhaustion and knew that we had each lost around 10 pounds of body weight in the previous month. In the last 10 kilometres of our 43 km day, the wind picked up and tried to blow us back up to the Fedchenko. On our final river crossing I was almost swept away because the bottom of my sled was caught by the swift water, almost flipping me onto my back. Vince threw out his ski pole and pulled me to shore, where we had a quick rest and ate our last few Clif Shots. Then with Camp 13 insight and we got hit by a big dust storm which was soon followed by a torrential downpour. Having walked 43 kms, we dragged ourselves into camp, wet and exhausted. We could see the road on the mountain side and knew that another SUV would greet us with the next sunrise. one of the many distributaries from the glacial runoffs. Skier and writer Holly Walker lives in Whistler when she is not traveling in search of perfect pow. She is sponsored by Mammut, K2 Skis, Clif Bar, Smith, POW and Mons Royale. The Fedchenko Expedition was made possible with grants from the MEC Expedition Support Fund, Alpine Club of Canada Jen Higgins Fund and Polartec Challenge Grant. Additional expedition sponsors include inReach Canada, Goal Zero, Clif Bar, Darn Tough Socks and Beal Ropes. Over 350-pounds of clothing donations to villagers in the GBAP was made possible by Mountain Equipment Co-op, Whistler Blackcomb and the kind people of Tahoe and Whistler. Special thanks to Pamir Guides / Saidali Gaidbuldaev for ground transportation and logistics and to Sebastian Tallent for Pamir weather updates.